Watch about three hours total of science-related shows or documentaries that involve projectiles, aviation, weather, astronomy, or space technology. Read (about three hours total) about projectiles, aviation, space, weather, astronomy, or space technology. 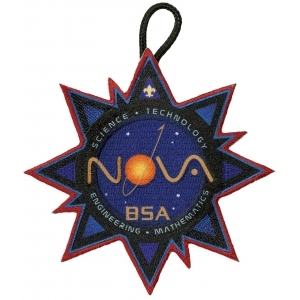 After completion, discuss with your counselor how the merit badge you earned uses science. Simulations. Find and use a projectile simulation applet on the Internet (with your parent's or guardian's permission). Then design and complete a hands-on experiment to demonstrate projectile motion. Keep a record of the angle, time, and distance. Be sure you have your parent's or guardian's permission before using the Internet. Some of these websites require the use of Java runtime environments. If your computer does not support this program, you may not be able to visit those sites. The difference between forward velocity and acceleration due to gravity. Discover. Explain to your counselor the difference between escape velocity (not the game), orbital velocity, and terminal velocity. Why are satellites usually launched toward the east, and what is a launch window? How fast does a bullet, baseball, airplane, or rocket have to travel in order to escape Earth's gravitational field? Visit an observatory or a flight, aviation, or space museum. During your visit, talk to a docent or person in charge about a science topic related to the site. Discuss your visit with your counselor. Find out what time a satellite will pass over your area. Watch the satellite using binoculars. Record the time of your viewing, the weather conditions, how long the satellite was visible, and the path of the satellite. Then discuss your viewing with your counselor. Keep track of your experimental data for every attempt. Include the angle of launch and the distance projected. Make sure you apply the same force every time, perhaps by using a weight to launch the marshmallow. Discuss your design, data, and experiments - both successes and failures - with your counselor. Design a pitching machine that will lob a softball into the strike zone. Answer the following questions, and discuss your design, data, and experiments - both successes and failures - with your counselor. At what angle and velocity will your machine need to eject the softball in order for the ball to travel through the strike zone from the pitchers mound? How much force will you need to apply in order to power the ball to the plate? If you were to use a power supply for your machine, what power source would you choose and why? Design and build a marble run or roller coaster that includes an empty space where the marble has to jump from one part of the chute to the other. Do the following, then discuss your design, data, and experiments - both successes and failures - with your counselor. Keep track of your experimental data for every attempt. Include the vertical angle between the two parts of the chute and the horizontal distance between the two parts of the chute. Experiment with different starting heights for the marble. How do the starting heights affect the velocity of the marble? How does a higher starting height affect the jump distance?